Welcome! 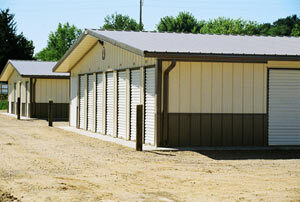 Kane Road Mini Storage is a family owned and managed facility. We provide the lock and key for every storage unit. There is vaulted insulated ceilings, concrete flooring, and security lighting. Our self storage facility is located on the west side of Eau Claire, WI. We have three buildings with a total of 110 units. Our smallest unit is 5x10 and our largest is a 10x30 with multiple sizes in between. a height of 7 feet. to assiting you with your storage needs. Below is a space guide to the storage unit sizes we have offer. 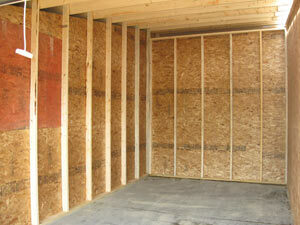 Choosing the best size of storage space to fit your needs will save you money. Our self storage guide will help you make the most of your storage space. We offer many different units to choose from. Don't know where we are located? Take a look at our map for directions or follow the directions we've provided. From Clairemont Ave: Take Menomonie Street and Go West. Take a left of Ferry Street. Take a Right on Crescent Ave.
(County Rd TT)and the buildings will be on your right. From Cameron St: Go striaght on Cameron St. On your left look for Kane Rd. Take a left on Kane Rd (County Rd TT) and the buildings will be on your left. I called Kane Road Mini Storage asking about units and pricing and was very glad we did! I spoke with Cindy who is professional and kind. I explained my situation to her and she told me she could help. When I was ready to move my belongings into storage, she found me the perfect unit for everything! The units are clean and in a nice area of Eau Claire. I have no concerns about leaving my belongings there. I've had my things in a storage unit before, but I never felt comfortable like I do leaving my things at Kane Road Mini Storage. I had a great experience renting from you! You were very friendly and flexible when I needed it the most. Thank you very much! (715) 828-4834 or email us at info@kaneroadministorage.com.We value our customers and encourage you to contact us with any questions you might have regarding our storage units. We look forward to hearing from you.